The Bankruptcy Code requires all bankruptcy filers to complete pre-petition bankruptcy counseling in the 180 days prior to the filing of their petition. The standard counseling session last between 60 and 90 minutes and the representative can answer any question you may have. 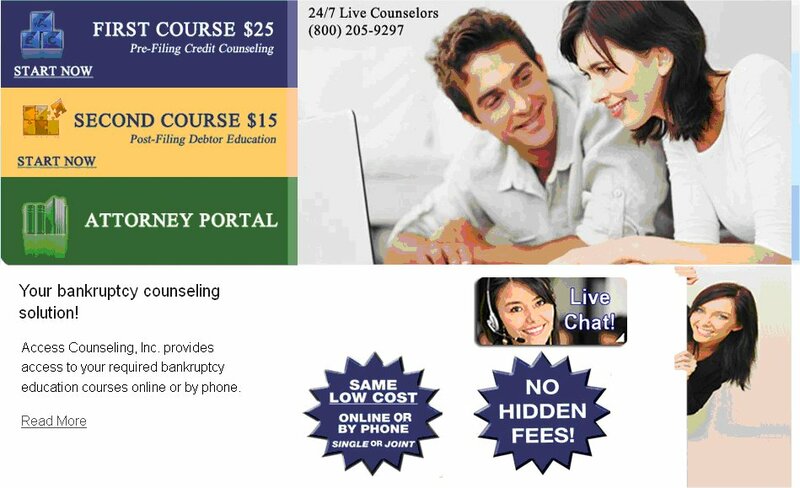 Your bankruptcycannot be filed without this course completion. $25.00 Individual or joint, internet or telephone. Both courses are available in English and Español. Once you have filed your bankruptcy case you need to complete the 2nd half of the required courses called “Debtor Education”. This is a highly time sensitive component if your bankruptcy. The bankruptcy court will dismiss your case if you do not complete this course within the time frame. We ask that you complete the course and have the “Certificate of Debtor Education” faxed/emailed to us before you attend your 341 Meeting of Creditors so we can comply with the time constraints.